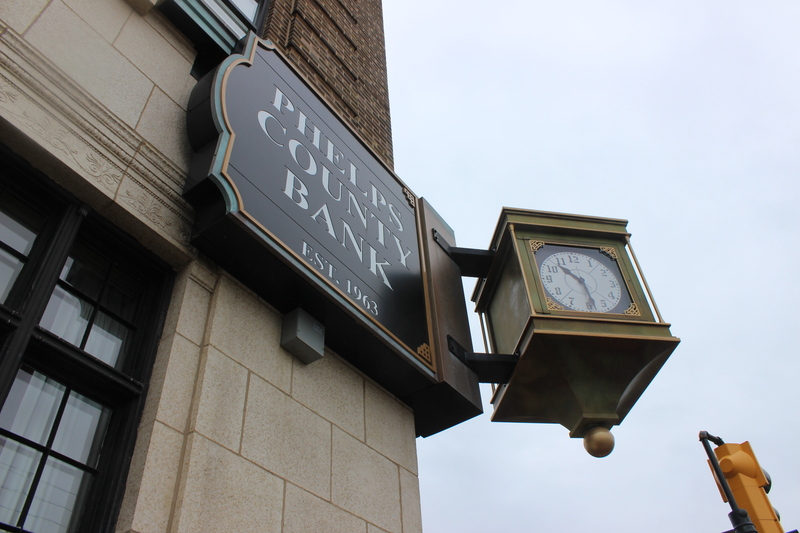 Foam Engineers was recently contracted to insulate an area of the Phelps County Bank in Rolla, Missouri. The area was on the fourth floor of the building and was being used for storage because of its poor insulation. The bank has plans of converting the space into a large new conference room. 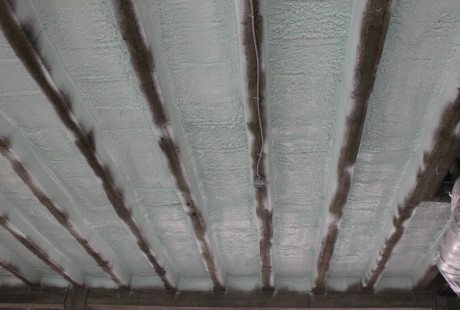 After consultation, closed cell spray foam was determined to be the best choice. Foam Engineers, insulation contractors, spray foamed the interior of the Phelps County Bank in Rolla, Missouri. 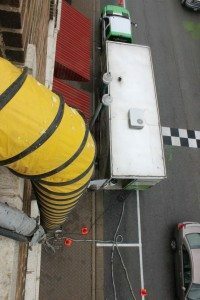 The work was done on the fourth floor of the building. The yellow tube provides ventilation, as everything must be sealed and covered while the foam is being sprayed. Foam Engineers applied spray foam to the underside of the roof! A view looking down at the foam rig from the top floor! 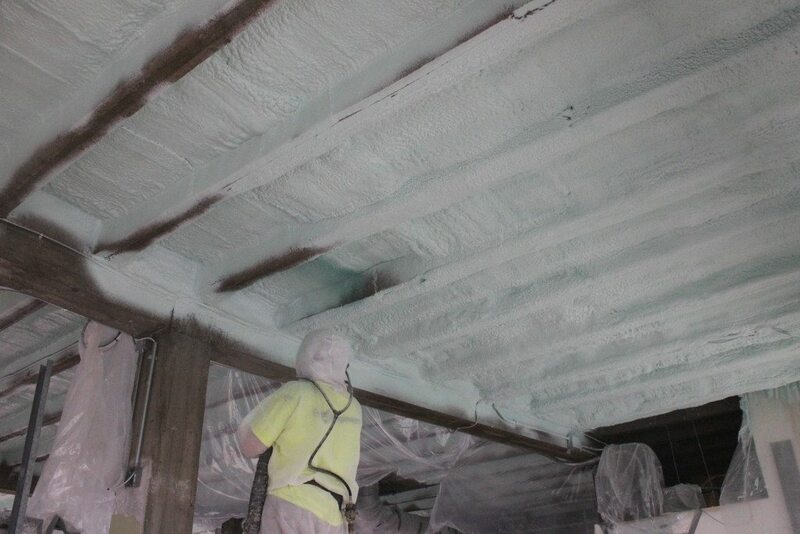 Roughly 4″ of closed cell spray foam was applied to the concrete ceiling between the rafters. Closed cell spray foam is much more dense than open cell foam. The spray foam itself is actually mixed from two separate components, which are stored in barrels on the Foam Engineers’ rig. They are heated to a specific temperature, over 100 degrees F! As they are pumped out of the rig, they travel through the heated hose line to the sprayer. When the trigger is pulled, the two components meet and react, causing the extreme expansion of the foam. 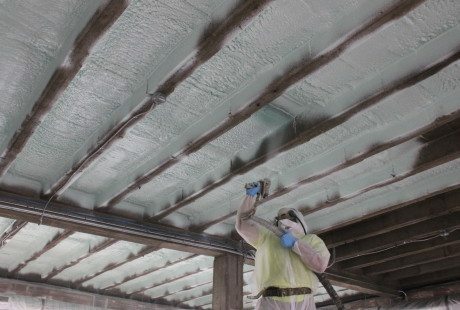 Foam Engineers applies the first coat of closed cell spray foam to the concrete ceiling of the Phelps County Bank. The first coat of foam was roughly 2" thick. Closed cell foam is very dense and boasts high R-values! Because of the chemical components, the Spray Technician and team need to be very knowledgeable. 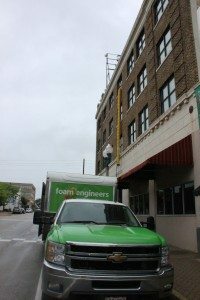 Foam Engineers employs the best quality workers who are throughly trained on the craft. Both the heat and density of closed cell spray foam means that it needs to be applied in several small coats. This gives each coat time to cool before the next coat is applied. 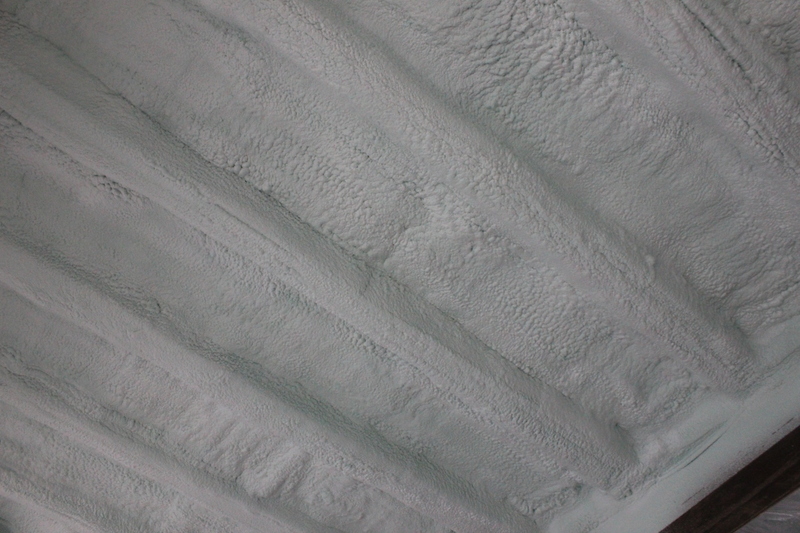 After the desired depth was reached on the ceiling, a coat of intumescent paint was applied over top of the foam. This acts as a thermal barrier and satisfies local and state fire rating requirements. The 4″ foam thickness gave the ceiling a R-value of 28. The room will now be extremely efficient and work great as a new meeting space! Foam Engineers applies the second coat of closed cell spray foam. The ceiling and rafters were all coated to prevent any possibility of thermal bridging.